JR Futcher Advice to Sailors Motivate Yourself! First-time SpinSheet Century Club member JuneRose “JR” Futcher says, "I knew I could do this… I am a proud sailor to be sure!” Here’s what she told us about her 108 days on the water in 2017. In addition to sailboats, were any of your on-water days on powerboats, kayaks, or other crafts? Yes, kayaking and race committee service. I am quite fond of kayaking, and it's an ideal excursion between sailing and on those be-calmed Bay waters… I have a fondness for race committee service, so I take the time to support regattas in DE and MD often. And photographing regattas and series is often on the agenda. Yes, I am busy little small business operator and environmental activist. I also hang with my mother, (do some) professional photographing and seasonal Beach Plum canning. I make sailing happen. Do you have a few days that stand out as the most special ones on the water in 2017? Yes, my sailing highlights are mostly on the Delaware and Chesapeake Bays. I sail my Laser from Lewes Beach on a southeasterly thermal and at a dreamy reaching speed, sail straight for the convergence of the Atlantic and Delaware, crossing the ferry lanes and make a rounding of the Lewes Harbor Breakwater. Generally, it's a long-lasting sail at four hours. Also, three days of race committee: The International 505 World Championship Regatta was not only a year's highlight, but also makes the top as a premium experience serving in a regatta and supporting sailors from across the globe on the Chesapeake. Being among world class sailors and my friends competing was wonderful. 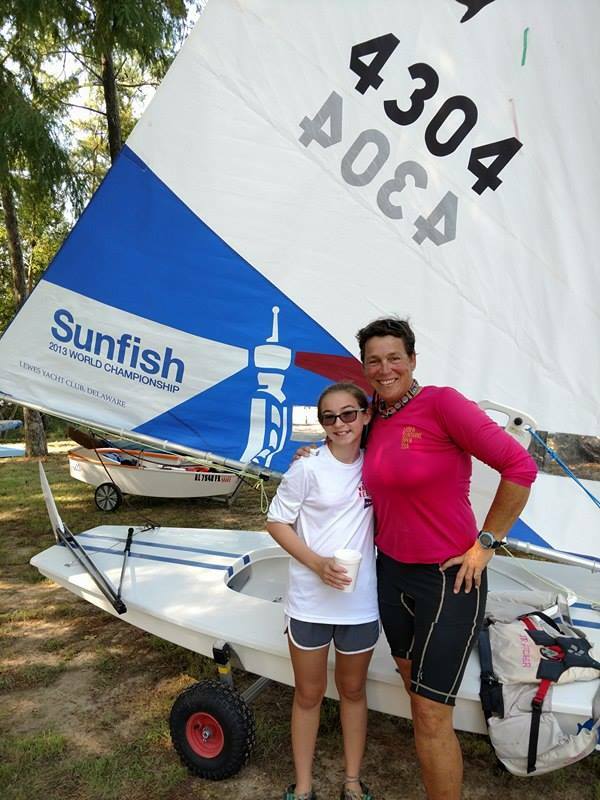 I finished in third place in race five of the women's Sunfish North Americans at Fairhope YC, Alabama. Not that I am surprised but I am making advances in the Laser and Sunfish; preparing and training for major master's regattas. And meeting young Emily also from Delaware on Mobile Bay at the women's regatta. Did you experience anything scary? I was properly scared at the sight of a hefty storm cloud just as I sailed into Mobile Bay. This was my first sail on the RS Aero and while working the helm for control (a light and rocky craft!) a good stretch off-shore, the very sight terrified me. I could not sail fast enough back to shore... Broken finger sustained launching my Laser. Could not understand the extreme pain and avulsion wound as the panic grew, blood spattered; I collapsed, then staggered to find neighbors. Wildlife sightings have to be the blue heron at dusk. As I am paddling or sailing at the very edge of low tide surf, in rapidly altering colors, there can be a "sudden" appearance. At first glance the heron has a stately human posture on the hunt for fresh fish. I love those nature moments. Did I forget to the porpoises underway in the wake of my Laser? Did you learn anything by being out there so often? Reinforcement that sailing is my lifestyle and waterways hold everything, always abundant. What would you advise a sailor considering our Century Club in 2018? Motivate yourself when time is short and life is full; take a small excursion as the sun draws and colors change. Try a regatta while learning, but always know your skill and limits. When a call for race committee comes, answer and support a regatta. You will learn race management and rules and observe sailing performance to apply in your sailing. Make a sailing log with comments, guaranteed to make you proud. Find more stories of the Century here.